Every once in awhile a new TV show comes along and is so unique that I must comment on it. 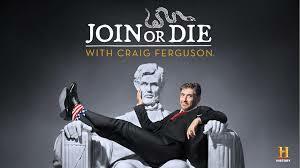 “Join or Die with Craig Ferguson” is one of these shows. It airs on Thursday nights on the History Channel. It is a hybrid of history and entertainment. One topic is chosen each week such as history’s worst medical advice or history’s worst political blunders. Then the panel made up of a professor, a comedian and an actor discusses six examples of the topic. At the end the panel of “experts” along with the audience picks the winner. By the way the show’s name comes from a political cartoon by Benjamin Franklin. Witty, funny and fast paced.